Georgetown University Center on Education and the Workforce released new research which shows that more often than not, elite private colleges are only open to the wealthy. The study shows that this class divide in higher education is predominantly fueled by selective colleges. In fact, 69 of the most selective private colleges ran average annual budget surpluses of $139 million over the last four years, yet admitted fewer than 20 percent of Pell Grant recipients. 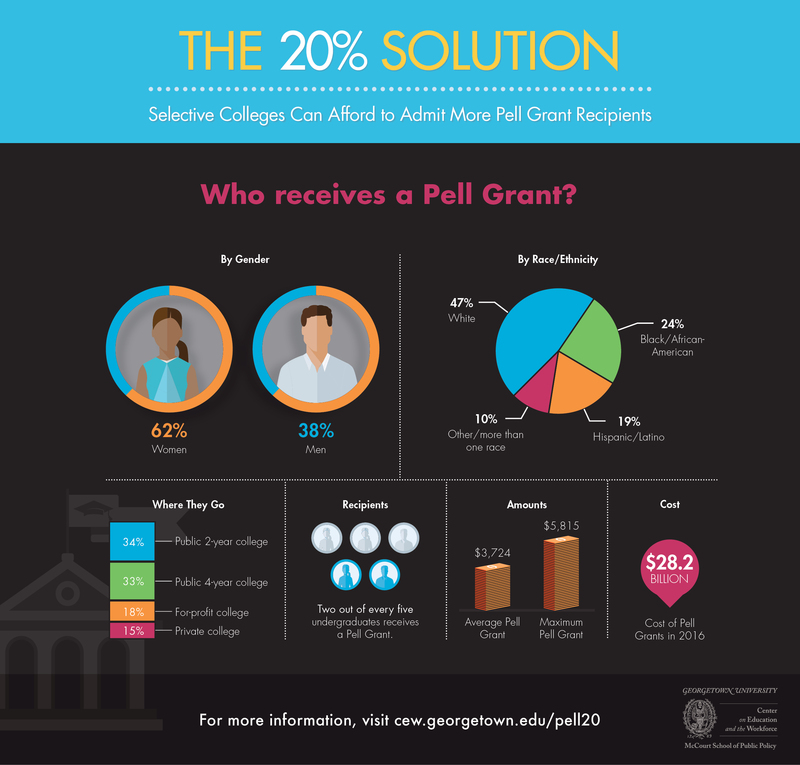 The 20% Solution: Selective Colleges Can Afford to Admit More Pell Grant Recipients finds that nearly 90,000 Pell Grant recipients score at or above the median on standardized tests but do not attend selective colleges. The analysis explores a possible solution to closing the opportunity gap. Requiring a minimum enrollment standard of 20 percent Pell Grants at all colleges could equalize opportunity in higher education. The nation’s most elite universities could enroll more low-income students without significantly hurting their graduation rates or budgets. Overall, only 6 percent of the 5,500 colleges and universities in America would have to change their student mix to meet the 20 percent threshold. Click here to see how individual colleges and universities rate.